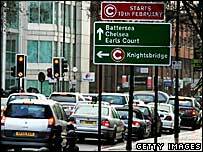 London's congestion charge may have delivered a small, unexpected health boost to the capital, say researchers. The charge was introduced to cut traffic, but a study in Occupational and Environmental Medicine says reduced pollution has aided health as well. Scientists from two London colleges calculated that since 2003, 1,888 extra years of life had been saved among the city's seven million residents. Transport for London described it as a "welcome side-effect" of the charge. The study is published in the journal Occupational and Environmental Medicine. It currently costs a motorist £8 to enter the centre of London during working hours, and Transport for London data suggests that car journeys within the charging "zone" have fallen by a quarter. The link between certain types of traffic pollution and health problems, including heart attack and breathing problems in children, are well-established, and Transport for London's own figures estimate that the capital's poor air quality is responsible for 1,000 premature deaths and 1,000 extra hospital admissions every year. It recently launched a "Low Emissions Zone" targeting principally high-polluting heavy vehicles in a bid to meet London Mayor Ken Livingstone's target of a 16% improvement in air quality by 2012. Scientists at the London School of Hygiene and Tropical Medicine, and King's College London wanted to examine further if traffic reductions since 2003 could have had a direct impact on health. They used a computer model to work out changes in air pollution based on the traffic figures, and looked for any relationship between this and death rates in areas in or near to the charging "zone". Within the central charging area itself - where relatively few people actually live - the benefits seemed more significant, with an extra 183 years of life saved for every 100,000 residents. This does not necessarily mean that every resident received an equal but tiny slice of this, as the benefits to certain people, such as those with existing heart or lung problems, are likely to be greater. Outside the congestion charge areas, the benefits were far less, totalling an extra 18 years of life per 100,000 residents. However, because the number of residents there was much higher, this added up to a total of 1,888 years spread across the whole of London. While acknowledging that the benefits were fairly "modest" in size, the researchers said that traffic-cutting schemes could still be considered as potentially health-improving policies. They wrote: "Policies affecting a larger geographical area and residential population, and which directly aim to reduce vehicle emissions, are likely to have larger public health impacts." Across the whole UK, the impact of traffic pollution is far more significant. Defra has estimated that, in a century, we lose approximately 39 million years of life. A spokesman for Transport for London said that the congestion charge, together with the "Low Emission Zone", should dramatically reduce the number of people living in areas of the capital in which air pollution was a threat to health. She said: "The congestion charge was introduced five years ago primarily to tackle congestion in central London, but has also had some success in reducing CO2 emissions and pollutants harmful to human health. "This ground-breaking work in the capital is expected to have an impact throughout the world as other cities follow London's example."